Another tome of dubious nature dropped on the doormat the other night and steadily released it’s contents of rain water onto our floor. I mean, who delivers the Yellow Pages on a stormy Monday night in almost horizontal rain at 9pm? Sigh. Really, how does it survive in these days of the Internet, it even pleads quite naively on the front cover ‘Look Inside For Web Addresses It’s Like Google From The Pound Shop’ (I made that last bit up) Indeed it does give paying advertisers their web address just like it has always given phone numbers which leads me to think that maybe I could find them on the web anyway but then again, most businesses that advertise in the Yellow Pages seem to have some of the most obscure names. ‘Hello Bago’ was one selling furniture whilst Hair-B-Wigs was unfortunately lacking in originality if not spelling. 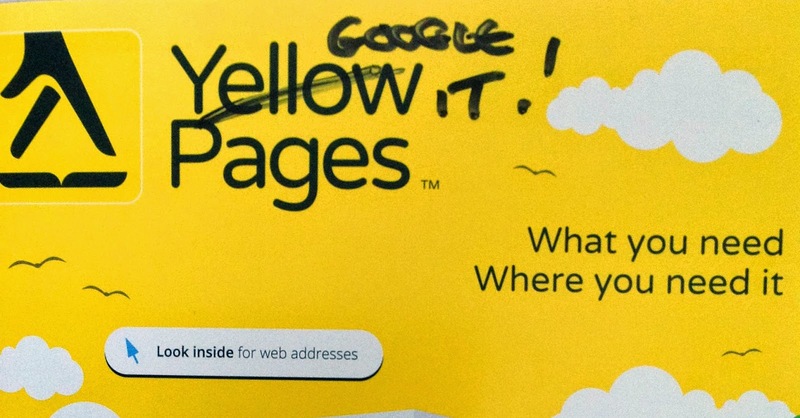 No, the best thing about the Yellow Pages is playing it like a board game. It’s really easy, simply choose a category and see how many times it redirects you, the more redirects the bigger the score! Simple! Lets start with Book Shops (this is the Chester And Mansfield Edition should you wish to play along). I go with Jewellers Page 141 and find to my surprise Other Options Antique Dealers Page 16 it’s like Inception, its a book within a book within a book. Hope you are keeping up because my brain hurts. If you need treatment on your feet you need a CHIROPODIST who deals with feet. Who knew! If you need beauty treatment then go to a BEAUTY SALON or HAIRDRESSERS. Ah! There’s where I have been going wrong, I will no longer get my haircut at the butchers. I now know why its shortened to YELL. Whilst we are at it, who remembers the little stick man they used to hide on the pages? I bet he’s hiding in shame.